“Blend of livestock rearing and crop cultivation facilitates the farm to progress in a balanced way inter-dependent on one another. There will be some solution found within the farm to safeguard the farmer from the losses. In my farm I rear cows, goats, sheep, rabbits and poultry birds commercially. The waste obtained from these animals is turned into manure for all the crops and trees in the farm. I am presently using chemicals for few selective crops namely sorghum (jowar) and ginger. Slowly I shall quit chemical agri inputs completely and make the farm self-sufficient as the main source of manure will be from livestock and other green waste. 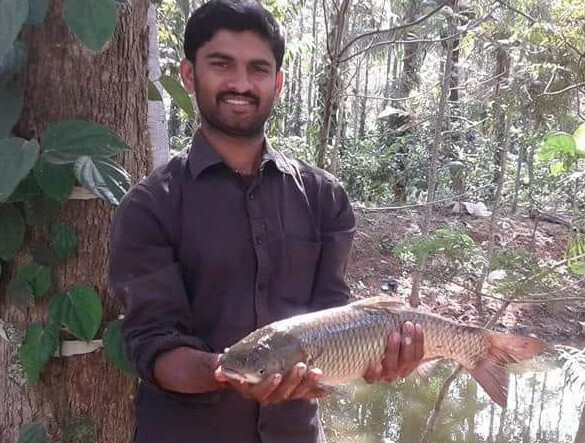 Although the farm revenues vary every year yet it is more than a profession for me,” says Mr. C.M.Naveen Kumar, progressive and passion driven farmer. His 8-acre farm is located at Chikka Bommanahalli village, Hassan district, Karnataka. “I completed BA and got a secured job in police department. However, as I am from farmer’s family I felt I will be able to serve the nation better as farmer,” asserts Mr. Naveen Kumar, the drive to become the farmer. Farm has thriving coffee, coconut and areca nut plantation. “There are 100 coconut trees in 2 acres and 5, 000 silver oak trees in 5 acres. Silver oak trees are supported by pepper climbers and intercropped with ginger. I have also planted silver oak trees on the farm border. 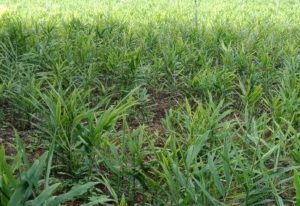 Arecanut plantation is intercropped with fodder corn,” he shares. Coffee, ginger and coconut are the main crops. Vegetables cultivated in the farm keeps changing as per the season. “At the moment I have grown coccinea and next will sow the seeds of bitter gourd and brinjal after monsoon. Last year I grew chilies and got good yield. In this way vegetables keep rotating.” Other crops cultivated are ragi, jowar, pulses and grains. “Our farmland soil is fertile because we mulch back the trees leaves back into the soil. The population of microbes is good in the soil that replenishes the fertility,” affirms Mr. Naveen Kumar. Entire farm is nourished with farm input primarily prepared from the green farm waste and livestock excreta. “Leaves of silver oak trees and teak trees are decomposed with different livestock dung. Cow dung and urine are used for making the agri inputs as per guidelines of zero-budget farming,” he shares. The farm has 7 cross breed desi cows that yield approximately 6-8 litre milk/day/cow. It gives manure sufficient for the farm. “Milk is sold to Karnataka Milk Co-operative only if in excess at Rs. 22/litre,” he shares. There are desi breed poultry birds for eggs and chicken. Eggs are sold at Rs. 10/piece and Rs. 300/kg for chicken. The buyers are mostly the neighbours residing near the farm. Cows and poultry birds are left un-tied for free grazing and are also fed with azolla grown in-house. Poultry birds are also given greens, ragi and paddy waste. 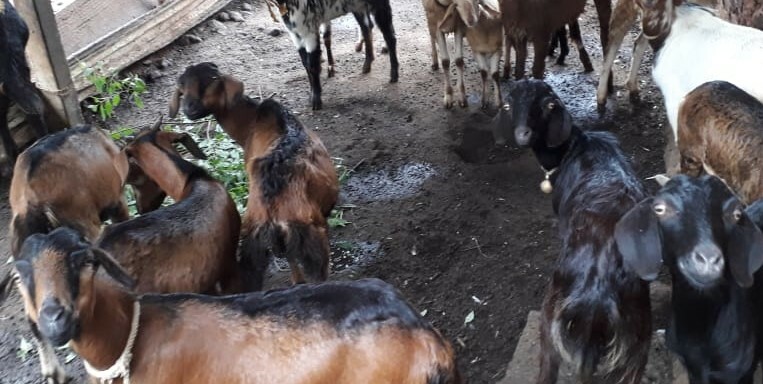 Local breed of goats and sheep also contributes in the farm revenues. “Presently we have 20 goats and 6 sheep. These are sold at our local (Santhe) village market. We have 2 pigs given by KVK, Hassan. It is fed with cooked rice and other kitchen waste. I have ducks, turkey and rabbits as pets but sold for breeding purpose to other farmers. I also had fish but discontinued for past three years due to water scarcity. However mostly I shall resume it this year as the monsoon is fairly good,” states Mr. Naveen Kumar.